We understand to begin to have change in our lives, we have to have knowledge but in knowing the knowledge what does this lead to, what is supposed to happen next and when is it going to happen. These are the things that many of us struggle with the most. We know what the word of the Lord says but how to we act the word out in our life, how do we truly wait on the Lord and know when to move. When we are given the opportunity to live in Christ, we are given the opportunity to live a life of good and happiness, with trials and tribulations that will bring us closer to the Lord and make us even stronger in Him. It is in this we must relax and enjoy our lives. There is a picture that I put on my page with a quote from some group but the quote states: “Don’t dwell on what went wrong. Instead, focus on what to do next. Spend your energies on moving forward toward finding the answer” Yet someone stated that it was hard to do… I applaud them for admitting that they have a hard time doing this because they are not alone. This word is a key word in living for Christ and staying on the path that helps us to live our lives and being able to adapt to the change that comes our way and allows us to have a better handle on life. I attended a women’s day at El-Bethel Church in Wilkinsburg, PA that was so awesome and informative that I must share with you (again) what I learned. Each lesson, I will leave you with a nugget from the lessons and may it help you. 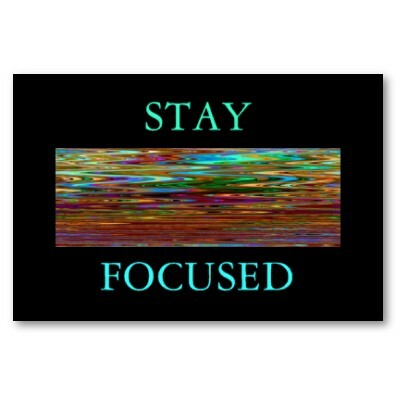 FOCUSED stands for: Faithful – Occupy – Commitment – Unified – Steadfast –Encouraged and Determined. This alone should help you understand how we must be so that we can live for Christ as He has called us to be. This week – Faithful is our word! Lamentations 3:22-24 (KJV) - It is of the LORD's mercies that we are not consumed, because his compassions fail not. They are new every morning: great is thy faithfulness. The LORD is my portion, saith my soul; therefore will I hope in him. These verses say it all about faithfulness. He is faithful to His words, He is faithful to us, He keeps us in Him and faithful in doing so…yet my question is are you faithful in Him? Many times we walk around knowing that God is faithful, but yet we are not faithful to Him. We say we want to be but when our backs are against the wall, we stop and do not move forward. We will not step out and allow the changes to come as they should. We stop the blessings that are coming our way because we stop having faith that things will be as God says it will be. It is in our faith and faithfulness in the Lord His promises come to pass. Yet how to you remain faithful to the Lord…are you faithful in your reading of His word, faithful in prayer, faithful in attendance in church by being an active member of the church, how about are you faithful in trusting Him and doing what you hear Him telling you to do? If you answer no to these questions…guess what God is good and merciful…thank you Lord for being so merciful to us – yet it is time to make that change in your life…make the change to be faithful to the Lord by doing what His word says. It is not as hard as we make it be, but it is in stepping out on faith and trying that the difference will come. When we walk in faith, we put aside our own thinking, our own desires, our own wants and we do what His word says…His word says that we are to love Him and to take up our cross and follow Him. We are to trust Him for our needs, for our wants, for our direction, for our love, and basically for all things in our lives. Yet are you doing this, if not today is a good day to start, yet know the minute things begin to roll in this manner in your life, you will find that you are faced with more adversity than before – don’t give up and don’t stop focusing on your faith in the Lord and whom He is and walk in HIS faithfulness until yours is developed. It is in our faithfulness in being obedient to Christ and following His words and building our relationship in Him, that our change will begin to form itself before us to the point where we will begin the process of soaring in Christ – anyone want to soar with me in Jesus??? Next time we are going to talk about the word Occupy – why not take the time to look up the meaning of occupy and see if you can figure out what it is you need to do in Christ with this word! You are right that we need to to be more faithful to God because He is faithful to us. The things you have listed, daily reading of His Word, praying, and attending church. I do all these things except for going to church. I have attended different churches throughout my life, but none seem like the right fit. How can I go about finding the right church when all the churches near are not the right fit? Thank you for part two of Change Is Coming. I agree that we as Christian must daily renew our minds and be faithful to God's word. God Bless to everyone. I must say that I really enjoyed reading, "The Change IS Coming", P.t.2. Faith is needed if we're to ever progress in the things of God. I can remember how having faith was very difficult for me, for I never knew what having faith was until I met my husband who was a diehard faith believer, I mean this man would believe God for a pencil with his name on it. Having faith was something I had to learn and discipline myself in, because where there is no faith, fear is present and a lot of times because of fear I missed out on the blessings and promises of God. Sometimes, it's not that we don't want to have faith, but because of past hurt, rejections and violations of trust, we put up a wall of defense and allow fear to set in and keep us from trusting, becoming like a stagnant river unable to flow in a life of peace, joy,and blessings. Change is definitely coming, when we allow our faith to mature to the level of trust in God allowing him to have full control, but we have to let go of what is in our hands and place our trust and our life over into his hands. I found in my own experience Faithfulness is something that comes with maturity. It took me a long time to learn how to be faithful to God because I was unable to be faithful with the small responsibilities I was given. Many times it was the enemy who put obstacles in my way and other times it was me not wanting to listen to God. Wanting to take the easy way out all the time. I didn't want to suffer. I was not willing to wait. I failed miserably everytime I tried to be faithful and became discouraged. Now I'm 36 and I see that the suffering has made me wiser and this wisdom teaches me how to deal with situations. Suffering in with Christ in my life is helping me to be more faithful to God. Without Jesus, I don't have a faithful bone in my body. Thank God for teaching us by His own example and giving us wisdom to live faithfully in Christ. I MYSELF AM GULLTY OF NOT BEING STILL AND JUST LETTING GOD DO HIS WILL. I RETIRED NOT BECAUSE I WANTED TO BUT AT THE TIME IT WAS NECESSARY. I USED UP MY PENSION MONEY AND I LOST MY APARTMENT BUT GOD SAW FIT TO KEEP MY HUSBAND WORKING. WE MOVED IN WITH HIS MOTHER, WHICH WAS DIFFICULT BECAUSE SHE DOESNT LIKE ME. I HAVE TRIED TO BUILD A RELATIONSHIP WITH HER BUT SHE SEEMS JEALOUS THAT I MARRIED HER SON. I HAVE HIGH BLOOD PRESSURE AND ITS GETTING WORSE, I HAVE ARTHRITIS ON MY SPINE AND A SLIPPED DISC IN MY BACK. MY LEFT HIP IS SWOLLEN AND HURTS CONSTANTLY AND THE PAIN IN MY LEGS IS SO HORRIBLE I CANT SLEEP AT NITE. I HAVE A SON AND HE IS INCREDIBLE I VISIT HIM OFTEN HE HAS A WIFE AND SON AND ANOTHER SON ON THE WAY. MY HUSBAND AND HIS MOTHER HAS HAD MANY ARGUMENTS ABOUT ME BECAUSE HE MADE IT CLEAR THAT HE WOULD NOT ALLOW ANYONE TO DISRESPECT HIS WIFE. HE SAID I WOULD UNDERSTAND IF U ACTUALLY DID SOMETHING FOR HER TO FEEL THAT WAY BUT U HAVE NEVER SAID AN UNKIND WORD TO HER. I STILL RESPECT HER BUT SHE SAID SHE DOESNT HAVE TO RESPECT ME OR HIM BECAUSE THIS IS HER HOME. I APPRECIATE MY HUSBAND AND LOVE HIM VERY MUCH, BUT LIVING WITH HER HAS ME SO STRESSED OUT I CANT THINK STRAIGHT, I LEAVE OUT EVERYDAY TO GO TO THE LIBRARY AND SIT FROM 12PM TO ABOUT 6 PM SO I WONT JUST BE SITTING AROUND IN HER HOUSE, SHE TREATS ME SO TERRIBLE BUT I PRAY TO GOD TO HAVE MERCY ON HER SOUL. THE LORD BROUGHT ME THROUGH A BAD SITUATION AND I LOVE HIM FOR THAT. HE IS CONSTANT IN MY LIFE AND I WILL NEVER STOP PRAISING HIM, BUT LATELY I HAVE SLACKED OFF BECAUSE I FELT LIKE HE WASNT MOVING FAST ENOUGH FOR ME, BUT I REALIZE GOD MOVES AT HIS OWN PACE. I WOULD NOT BE HERE TODAY IF GOD DIDNT COME TO MY RESCUE. HE IS WORTHY TO BE PRAISED. I HAVE TO GET BACK ON TRACK, I HAVE TO LET HIM KNOW I TRUST AND BELEIVE IN HIM AND THROUGH PRAYER I WILL BE OKAY. I AM HOPING AND PRAYING FOR THE DAY GOD REMOVES US FROM HER HOME AND PUTS US IN A BETTER PLACE. I BELEIVE HE DIDNT BRING ME THIS FAR TO LEAVE ME. TO GOD BE THE GLORY. My sister you hit it on the head...some things take baby steps...know that as you grow in the Lord, somethings will take time, and others happen overnight, knowing which is which will help you in your walk. Trust in the Lord with all thine heart and lean not unto thy own understanding - in all thy ways acknowledge Him and He shall direct thy path (Proverbs 3:5-6) notice it say to acknowledge Him in all that you do - when you do this - you will be able to hear His direction and as you walk in His direction - you will know His voice and once you truly know His voice - you can let go and move according to His will...shall be praying for you and if you need me sister - just hit me up! God bless and enjoy this day in the Lord! My problem as well is allowing God.And stop taking things into my own hands.And yes its so true,I agree.That once you become closer to god and his purpose and will for your life.You will be faced with every challenge there is.It really does seem as though the enemy works harder.When he see that ur worship becomes stronger and praises become more than before. I loved your message as it pertains to being faithful and focused. I know who my Lord and Savior is, but the hardest part for me is being "still" and letting go. This is the part of my faith that I truly need to help with. I don't know how to get out of my own way and let "GOD" do the things he need to do with me. The first part of this year has really been hard, but I'm taking baby steps and trying real hard to do better. I know I have a lot of work to do, but with "GOD" on my side, who can be against me.